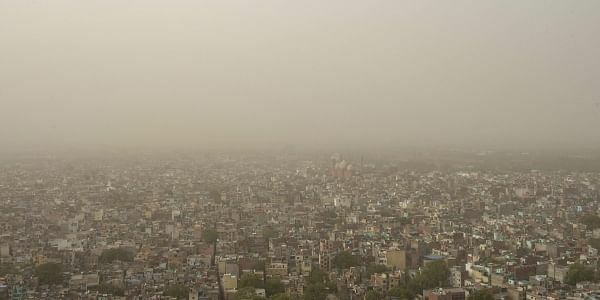 NEW DELHI: The national capital continued to remain under the grip of dust on Friday morning with the minimum temperature recorded at 33.4 degrees Celsius, six notches above the season's average, the Met Office said. "The dust raising wind which has been showing their effect since Tuesday shall continue for the day as well. There is no chance of rainfall," an India Meteorological Department official (IMD) said. According to officials, the dust was bought through winds from Rajasthan, Iran and southern Afghanistan. The maximum temperature is expected to hover around 40.5 degrees Celsius, one notch above the season's average. The humidity at 8.30 a.m. was 43 per cent. Thursday's maximum temperature settled at 42 degrees Celsius while the minimum temperature was recorded at 34 degrees Celsius, five notches above the season's average.